How do you stop a committee from ruining your logo design? OOOOOOhhhhhh, I LOVE this question! I’ve made an art out of dodging committees in my 2-plus decades of creating branding solutions. Not that I haven’t learned the hard way on many occasions. Most people have heard the expression, “the committee built the camel”, yet so few people that serve as a committee member are aware that they are part of this creativity killing machine. A committee’s INTENTION is to take the best minds the organization has to offer and make them overlords of specific tasks. Each member wants to feel (and look) like he or she is contributing while accepting the least amount of work possible. In the case of anything marketing and design related, they will salivate at the chance to play Creative Director. All one needs to do is find something “offensive” and their work is done. If he or she can find a way to shoehorn in the term “phallic symbol”, they get the bonus of feeling chic and edgy while being officious. Even if their creativity prowess is challenged by an Excel spreadsheet, each committee member will take turns stripping away any shred of uniqueness of your artwork — if you let them. Truly great design takes chances. Risks. It dares to be unique and not blend into a sea of “swoosh” logos. A committee’s success or failure with each venture is dependent upon the process that is dictated by the contracted party. Relinquish control of this and you will be pimping camels for a career. Logos I designed quickly and efficiently on a tight budget. Know your process and enforce it. First, let them know that you value their diverse opinions and will consider all of them (this is getting their “buy in”). But, let them know that they will not all agree on all aspects of the logo, as everyone brings a different background and baggage to the table. I have in my contract that I will provide 3–6 initial proofs of the logo, and that they can have three revisions thereafter. ← imperative. I explain that, upon first proof unveiling, 50% of my customers say, “Wow – I love #2 . Let’s go with that one!”. Done. The other 50% say, “I love this about #1, and that on #3. Can you incorporate that into one version?” This requires one more proof. Maybe one more tweak after that. Done. Any more proofs than that, and your committee turns into your creative director… and I don’t wish that on my worst enemy. They will devolve it into the ground and then blame you for not rescuing it. If you let this happen… well, you are to blame. So how do you enforce this, you ask? Simple: Each proof after the fourth (initial proof, 3 revisions) will cost $100/hour. Make sure you get a signed contract, and you won’t have a single problem. And, most importantly, you’ll have a happy client because you’ll have saved them from themselves. A quick addition: I also do “Facebook contests”. I put the initial logo versions on my FB page and ask for feedback. People LOVE voting on their favorites. You’ll get surprising and helpful feedback most times. But for committees – you now have a valuable case study that makes the process less personal and more professional. I usually tease my initial presentation with, “I did a case study on Facebook, and I was SHOCKED at the results that I tracked! But I’m not going to share it with you yet, because I don’t want to influence your opinions.” Priceless. Now, they’re more worried about pleasing their audience than themselves. 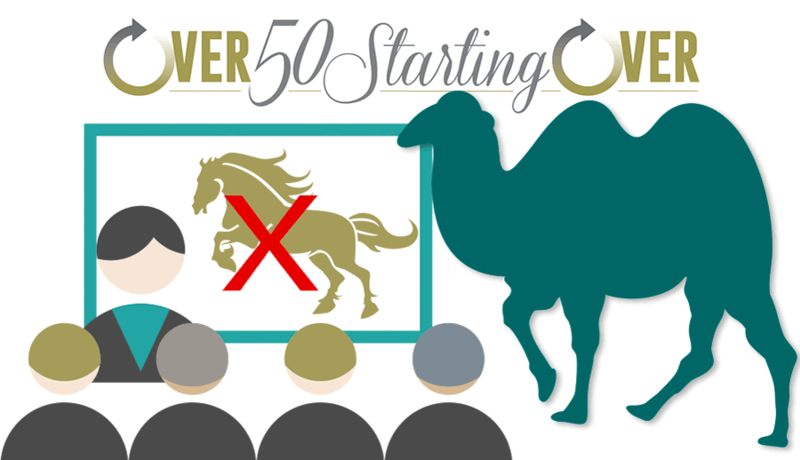 What is “Over 50 Starting Over”? Have a comment or question that you’d like discussed? Comment below, or contact me!